This 5 bedroom villa with swimming pool is located in Choeng Thale and sleeps 10 people. It has WiFi, garage and parking nearby. The villa is near a beach and within walking distance of a restaurant. Villa Paloma is one of the two sister villas inside Picasso Villas, housing 2 separate, fully self-contained luxury villas that share 1 football field together. 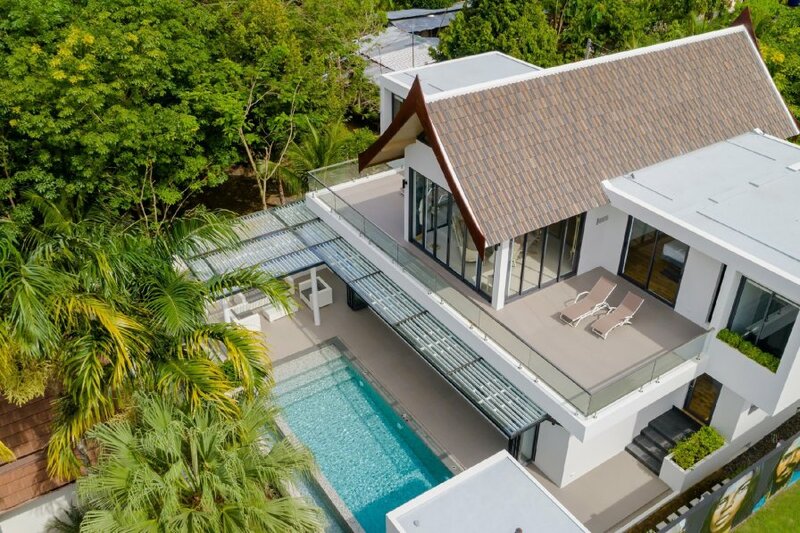 Palmo features a sleek, modern design with some Thai elements in its architecture such as the soaring, vaulted rooftop and a 1950s inspired interior design. Located in the west of Phuket Island, close to Bang Tao Beach, the environment is tropical and unspoiled and the villa boasts stunning views of hills and tropical greenery. The villa's walled garden is a place of tranquillity and serenity, featuring a private swimming pool with a waterfall feature on one side. The sound of rippling water, lush greenery growing by the side of the pool, the tropical sunshine and the clear blue sky - all is wonderful here in the garden of Villa Paloma. A covered terrace allows guests to have drinks and food alfresco style by the poolside. The best spot to work on your tan is upstairs on the terraces adjoined to the master suites, featuring gorgeous views of the surroundings and comfy long chairs to relax on. The living room of Villa Paloma is modern and stylish. Guests have the option to create a tropical open-plan living space or a closed-off living room with the help of glass bi-fold doors. The open-plan version of the living room allows you to jump straight into the swimming pool from the sofa. Kids will love it! The modern, comfy sofa is the perfect spot to relax with a book, enjoy your morning coffee or watch a movie on the wall-mounted flat-screen TV. In the middle of the living room stands the stylish 8-seater glass-topped dining table for those lovely in-villa family dinners and on the left, there is the kitchen that features a white breakfast bar with high chairs. Up on the first floor, guest will find yet another place to sit and have drinks. This stylish lounge room boasts stunning views of the surroundings and it is furnished with chic, retro sofas and armchairs and the lounge is decorated with antique artefacts and Jayne Mansfield’s movie posters. Villa Paloma features 5 bedroom suites; 4 luxurious and stylish suites in the main house and 1 extra bedroom with a private entrance. The 2 master suites are located up on the first floor, giving access to the upper sunbathe terraces to soak up the morning sun rays and the stunning views of Phuket Island. These stylish luxury suites are fully air-conditioned and they are fitted with large king-size beds and TVs for entertainment before sleep. One of the rooms features a writing desk and a bathtub in the en-suite and the other room comes with a sofa and a private en-suite with a rain shower. The 2 guest bedrooms feature twin beds configurable into double beds upon request. These rooms are equipped with modern amenities such as AC and TVs and each room has a private en-suite bathroom. The 5th extra bedroom is a small room with a double bed and AC and it has a private bathroom as well. sunny outdoor terrace furnished with long chairs. A great spot to soak up those views and work on your tropical island tan at the same time! In the garden downstairs, glistens the private swimming pool, topped off with a waterfall feature that adds even more tranquillity to the tropical environment. On the other end of the pool, there is an outdoor deck where you can relax on the round-shaped daybed and dine alfresco style. How tropical and wonderful! Villa Pablo houses 5 bedrooms in total. 2 luxurious master suites sit up on the first floor, adjoined to those sunny terraces with mountains views. 2 guest bedrooms reside on ground level with easy access to the living room, garden and pool. The last 5th bedroom is separate from the main house and it has its own entrance, great for those who like to have some extra privacy or families travelling with a nanny. The master bedrooms are fitted with large king-size beds, the guest bedrooms with twin beds and the 5th bedroom is furnished with a double bed. All of the room are equipped with AC and ceiling fans and they come with private en-suite bathrooms of which 1 boasts a bathtub in addition to the luxurious rain shower. All bedrooms except the extra 5th bedroom, feature large wall-mounted flat-screen TVs for your entertainment and there are large wardrobe closets to store your clothes and other personal belongings. Breakfast policy: THB 150/pax/day for continental breakfast. Upgrade to american breakfast for extra THB 100 (THB 250 total).